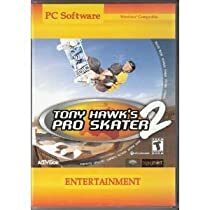 Ride with the skills of Tony Hawk, the most recognized skateboarding pro of all time. Or, skate as one of 13 pros or create a character from scratch. Master signature pro moves and hundreds of new tricks including nose/tailslides, nose/bluntslides, lip tricks, nollies, manuals and more. Design your own dream park in Real-Time 3D, using a variety of ramps, funboxes, rails and more. Multiple play modes include 1-player career and free skate modes as well as 2-player modes such as trick attack, graffiti, tag and horse. Ride to a killer soundtrack of hip-hop and punk tunes featuring Rage against the machine, Naughty by Nature, Papa Roach and more.